This detailed map is split between two counties, Northamptonshire and Buckinghamshire. On the west side of the River Ouse is Old Stratford, historically part of Northants; this is here a small gathering of buildings, including the Swan Inn and Furtho House, on Watling Street; a major feature is the Buckingham Branch of the Grand Junction Canal. On the east of the river is the much larger Stony Stratford, which developed as a major town on Watling Street, later the A5. Features include St Paul's College, Market Square, High Street, Corn Mill, Ousebank, St Giles' church, St Mary's church, Watling Works, Calverton End (in SE corner of map). There is also the tramway depot of the steam trams to Wolverton. 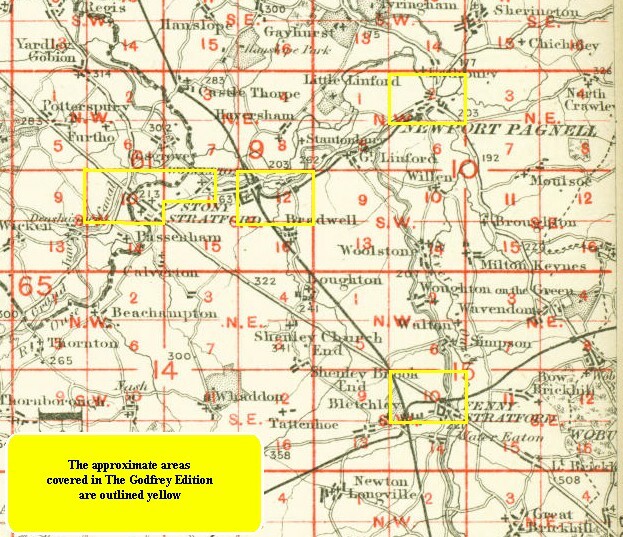 On the reverse we include a good section of the adjacent sheet 9.11 which extends coverage eastward to Old Wolverton, with Holy Trinity church, Wolverton Mill, Wolverton House, Locomotive Inn and Old Wolverton Wharf on the Grand Junction Canal. The tramway is shown along the main road. For 'New' Wolverton and the railway station area go to the Wolverton map. Follow this link for a complete list of our Buckinghamshire or Milton Keynes maps.